GIGA GRANADA HILLS: Bun Me! Sometimes, it's tough being a Granada Hillsian. Living out in the sticks as we do, there are so many things we have to travel for miles to get. Want to ride on a roller coaster? You have to go to Valencia to do that. Want some Ethiopian food? It's all the way down on Fairfax, which might as well be on the moon. Want to buy the fabric to sew yourself a frock? JoAnn's is all the way out in Porter Ranch. And if you want a Vietnamese Banh Mi Sandwich, you have to hitch up your horses and ride all the way out to the forbidden hinterlands of Northridge. It might have been worse, though. When he learned that his brother Keith planned to open a Banh Mi shop, Michael Bao Huynh, a very highly regarded chef who owns several Vietnamese restaurants in New York City, said he should put it on Melrose. But Keith, who lives over by White Oak and has kids at GHCHS, wanted something a lot closer to home. So he opened Bun Me on Reseda Boulevard. GH's sole Vietnamese joint, Good Pho You doesn't have Bun Me -- er, I mean Banh Mi -- they only have Bun, which means noodles. Confused? I am. But it's time to get things straight, now that these sandwiches have even risen to the point of having their own fan page. Bun Me (which is also offering a GigaGranadaHills discount) is kind enough to provide an illustration a dissected sandwich in their window for the uninitiated. 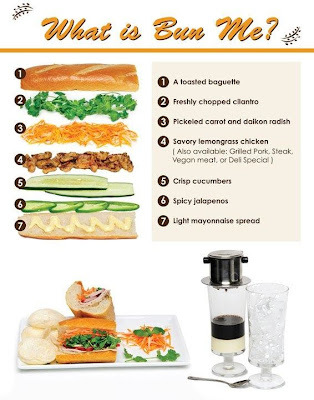 This diagram gives the basic idea, but unfortunately, doesn't depict the sandwich I love the best: the deli special, which is the most traditional Vietnamese offering on the menu. It's the one that features Char Siu pork, Vietnamese pork roll, and pate in place of the pictured lemongrass chicken. Getting even further from Vietnamese tradition, the shop also offers vegan versions of all of their sandwiches. The baguettes, picked up fresh every day from a nearby bakery, crisp-crusted pieces of French bread heaven, and make Subway's boasts about their sandwiches' bread suffer all the more by comparison. The three-month old shop's menu is still evolving. Some daily specials, by popular demand are on their way to becoming regular menu items, like the hot wings, and the Vietnamese twist on a Philly Cheesesteak. Another sandwich in the works: a Vietnamese style French Dip. "It's been Keith's dream to open a restaurant for as long as I've known him," says Angel, Keith's sister in law, who's manning the counter while her Keith keeps his day job as a network engineer and her sister works as a psychologist. Even mom and dad help out in the kitchen. "We're very family oriented around here," Angel laughs. Just then, a regular customer walks in, and Angel greets him by name. "Watch out," he teases, "you start coming in here, you'll get hooked!" SWEET JESUS I LOVE BANH MI. I am SO there. So cool! Gotta try one! This place is delicious! I love it and they are so nice!